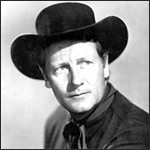 Western film star Joel McCrea portrayed Ranger Jace Pearson in NBC's Tales of the Texas Rangers, covering "more than 260,000 square miles" of modern-day frontier with "50 men who make up the most famous and oldest law enforcement body in North America." Their job was to solve major crimes, old-fashioned tracking techniques and psychological analysis. Tales of the Texas Rangers was broadcast over NBC from July 8 1950 through September 14, 1952 and was later revived on television.